My EE ROTK was shipped yesterday. And I just knew it wouldn't come today. I suppose it will come tomorrow and it'll be hours before I get a chance to look at it, what with hubby being here and shopping to be done. Ah well, I suppose it gives me a chance to do a few more of the 1001 things I have waiting to be done. It is, isn't it!! I feel I could just spend the rest of the day in complete happiness just staring at it. Mind you, I feel the same about most Fro/Lij pics!! happy bday from me too ! Wow that picture! Needed that to cheer myself up! I completely sympathise with you. My DVD has failed to turn up today too .... BLAH AND DOUBLE BLAH .... and I have the TV all to myself this evening. Tomorrow no chance. Day after, no chance ... typical! im sitting here...without the dvd and reading all that great stuff about it !! wanna see it too ! now im sitting here...watching tv and thinking about the dvd !! Thank you! Oh, did you remember I love that picture so much? Didn't you make that cap yourself once when I was looking for this 'that'll be a sad day indeed' Frolijah moment? Ah, I love this picture. 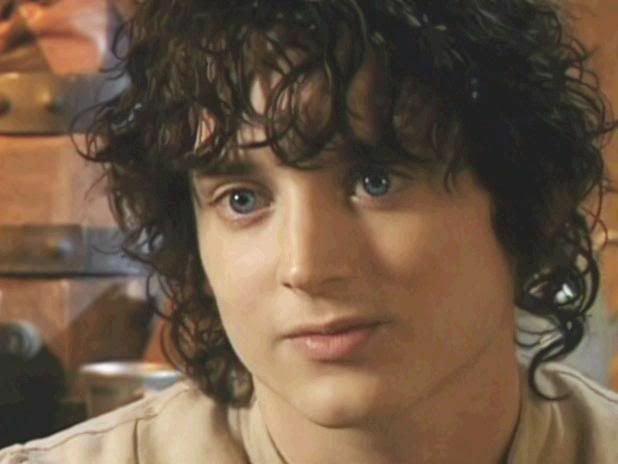 It was quite a co-incidence, I was just browsing through my Lij/Frodo pics wondering which one to send you, and (out of thousands!!) that was one of the first that caught my eye so I decided to use it. It was only a bit later that I suddenly remembered you'd asked about it some time back and I sent you the cap!! But yes, it is an amazing pic - and I was actually rewatching that clip a couple of days ago - I swear at the very end of it he looks ready to burst into tears.